.... Ghana Airways funds was his private account ... Over $90,000 paid in two years ... May have Lied under oath? Members of the Appointments Committee appear to be taking their work seriously in prosecuting their mission to weed out unfit materials to help the President achieve his vision of positive change chapter two. The three-man sub-committee set up by the Appointments committee last week set about looking into issues raised against three men whose appointments had been suspended pending further investigations and took the first step of looking into the petitions and evidence presented concerning the most senior member of the suspended trio. Honourable Ossei-Aidoo, who with another member, Hon. Twumasi-Appiah constitute the committee with Mr. F. Nutsugah as secretary, pushed for cross verification of a powerful submission by Raymond Archer, the celebrated investigative journalist of the year 2003 and immediate past acting editor of The Chronicle. Insisting on going for the 'primary source' rather than rely on the six-page dossier against Anane, widely perceived as the pet of the President, Mr. Nutsugah put a call through to the house of Alexandria Anane, nee O'Brien, the woman whose ravishing looks fell Dr. Anane, like Delilah in Biblical times. A man who answered the call told Nutsugah that he was the father of Alexandria, and was briefed about the object of the call. Apparently, Alexandria had been refusing to take calls from Dr. Anane who had been calling Alexandria before and after the vetting. Alexi, as Anane fondly calls her, indicated that she had been deeply humiliated at the way Anane characterized her during his vetting which she watched and studied. In conversations with Archer, she let her feelings hang out that she felt wounded by 'lies' told by Anane particularly suggestions that his wife in Kumasi had been making sure that Nicholas Anane the beautiful boy was well catered for. When finally, they got through to Alexandria, they asked whether Anane had sent her $90,000.00 in a single instalment or not. She replied in the negative, but explained that within the space of two years she had received from Anane sums in excess of $90,000.00 and that they came in more than two instalments. This was consistent with Archer's testimony that the young, balding 50 year old doctor blew $53,150.00 on Alexandria and his son in 2002, and for 2003, spent $52,600.00 on Alexandria.' Incidentally, she told the committee she had passed on copies of the hard copy evidence to Archer and they could collect them from him, in the event of being precluded from coming down to testify. It is unlikely that Alexandria will be allowed to come down to testify as the committee was bluffing when they first hinted that she would be allowed to come if money could be found to. Independently, Chronicle can report, arrangements are afoot to fly her in and out for what would be a devastating testimony loaded with cool irrefutable facts devoid of emotion. Mr. Raymond Archer had petitioned the chairman of the appointments committee of parliament last week challenging the acting Minister of Roads and Transport for not being truthful to the appointments committee during his vetting on February 28, this year. 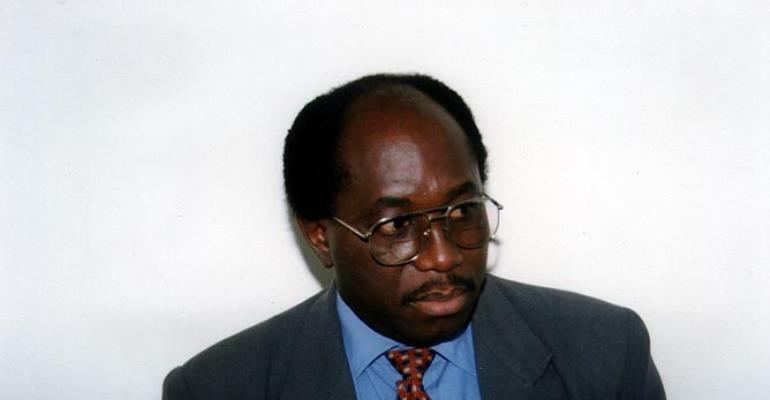 Mr. Archer held that he had evidence and could confirm that Dr. Anane actually billed the state, precisely, Ghana Civil Aviation Authority and the Ministry of Roads and Transport on expenses incurred by Ms. Alexandria Anane when the minister traveled to Montreal on official assignment. He explained in the petition, “It is important to note that the minister traveled to Canada with Ms. Alexandra Anane and his son Nicholas Anane whilst on that official trip. “All expenses incurred by Alexandria and his son on that trip were converted as expenditure by Dr. Anane and Ghana Civil Aviation was billed.” He argued Dr. Anane was not truthful when he said he had always distinguished his private affairs from his public duties. In his petition, the former acting editor of the Chronicle said he could prove actions taken by Dr. Anane was a cost to the nation. He stated he had documents in respect of communication between Dr. Anane and Alexandria, which suggested the acting minister was having an affair with the client of the country which cost the nation not only in financial terms, but also in terms of loss of opportunities for Ghana. In other words, contrary to assertions made by Anane that he was bonking for gold for Ghana, his adulterous conduct led eventually to a collapse of a project between the ministry of health (government of Ghana) and Alexandria's company.